Believe me, it is extremely easy to categorize someone as introverted or extroverted. Especially if you're a psych major like I am and you pick up on little details about the people you meet. I'm also not particularly fond of the way introverts are portrayed in the media. It tends to cast them in a really negative light a lot of the time and they get portrayed as antisocial rather than asocial which is really sad. I like how y'all like pairing introverts and extroverts together. They make fun duos~! Do you think there's any merit to the idea that the slow death of the thought balloon in western mainstream comics leads to more extroverts because they move the story along through dialogue/action? For some reason I keep thinking of old school Spiderman and the amount of time Peter Parker spent in his own head. The thought balloon is dying out, but the “voice inside of the character’s head” is still there, I think. The thought balloon is just replaced by a caption, but it only reflects the thoughts of the main character (or whoever’s point of view it is). Because I mean, think about instances where thought balloons are connected to multiple people and you can see what everybody is thinking. It kind of destroys any drama and is usually used for comedic effect. I’ve seen the “thought inside of character’s head” caption used in mostly introverted characters, by the way. I think any majority of ''types'' can also depend on the genre of the story. That said, I can kind of think of various examples of well done characters in both categories for broad genres. Like, in Shonen we have people like Ichigo Kurosaki, Kenshin Himura and Yoh Asakura (introverts) while also having Goku, Naruto and Luffy (extroverts). I actually think it might kind of even out, I guess. My protagonists tend to be more introverts, but I'm writing a superhero series where I can take the luxury of having an extrovert super identity and a more introvert normal identity. The usual. True. 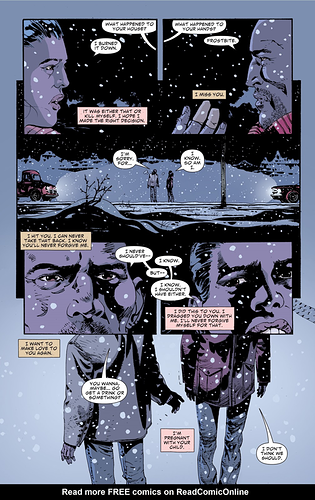 People usually use the thought balloon for retro purposes only since early 2000s. It's a stylististical choice and I think it actually depends more on the writer than on the character. Geoff Johns usually captions all his main characters, introverts (Flash Barry Allen) or not (Green Lantern Hal Jordan and Flash Wally West). Greg Rucka basically NEVER uses them, it doesn't matter the character. Also, Peter Parker is still completely lost inside his head nowadays, don't you worry! Because I mean, think about instances where thought balloons are connected to multiple people and you can see what everybody is thinking. It kind of destroys any drama and is usually used for comedic effect. I see your point but for an example of what I'm talking about...there was a relatively common trope in my youth of two characters thought balloons reveling a hidden attraction between them... and the dramatic tension that developed because of it. This was two people displaying introverted behaviors (sometimes more in love triangles and such) versus the inner caption style that can only display one point of view. In one, it's only a case of unrequited love that effects one character...the other reflects missed romantic opportunities for multiple characters. Good to see somethings never change. I always saw the verbose Spiderman character as him trying to hide, and in result overcompensate, for his nature tendencies. I didn't like the idea that the mask liberated him to act that way and that persona was his true self. My main character is an introvert who has social anxiety and the other lead is an extrovert, the whole story is about socializing and social anxiety. I love showing the positives and negatives of both extremes and it's really fun writing how the 2 characters interact. When I see anything featuring introverts that's about them being more open if often shows introverts as something 'bad' in a way? and being more extroverted is what they should strive to be, without showing how extroverts have problems of their own too. I like stories where the main cast has both introverts and extroverts. If there's only introverted characters, it get boring really easy, but I've seen some casts where the characters are all extroverted and that gets annoying really fast too. Not that they can't work, it's just a bit harder I think. Anyway, My MC is mostly introverted, I think because I relate to them much better since I'm introvert as well. But I avoid making characters that are like 100% either one, because I think that's kinda impossible. Every person is different, and not all introverts are shy or socially awkward in every situation. My MC is introverted, but is not that socially awkward. more like, doesn't need huge friend groups and doesn't enjoy being in the center of attention, or places that is full of people. He needs his time alone, and doesn't mind the silence. I like when these kind of characters need to learn to be a bit more social, but in a comfortable way to them. I also have Extroverted characters in my main cast ofc, but their also not 100% only extroverts. Everyone has their problems. Peter is a clever boy, maybe he gave Spiderman an extroverted persona to avoid suspicion. Also he may have some fun roasting villains with his wit too. He can`t be so savage in high school/college without a bully wanting to fight him and risk exposing his real strenght. So it may be some form of escapism. I agree that Peter is an introverted at heart, but maybe he is blowing some steam when he plays Spidey`s attitude. there was a relatively common trope in my youth of two characters thought balloons reveling a hidden attraction between them... and the dramatic tension that developed because of it. To be fair, nothing stops people from doing it with captions. It's more usual to focus on one character, but I've already seen something similar to what you pointed with captions. 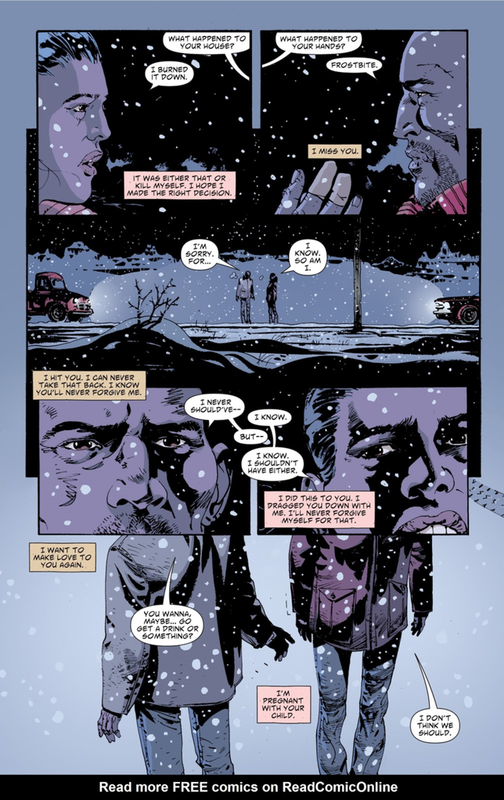 This is from Scalped #42. I can get behind that. I think Peter can certainly have fun with it. It's not that Spiderman makes him free to be his true self, is more that he's such a stressed person that when he puts on the mask, he can forget a little. I mean, that and the whole responsibility thing, of course. 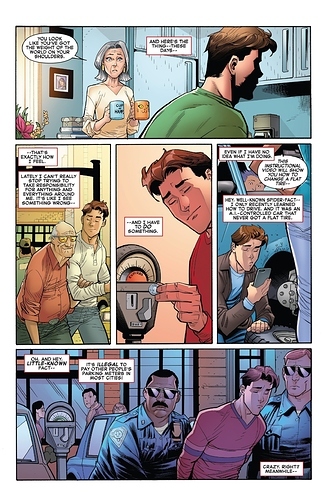 Brian Michael Bendis, which wrote Spidey comics for freaking 18 years straight (creator of Miles Morales, for context), wrote in Spider-Man Generations (in which his Miles goes back and meets Peter in high school, because comics) that Spider-Man is ''Peter Parker's pain''. I think it's an interesting view of it. Many establish that Peter keeps making jokes to try and calm himself when he's on the field, since he's such a little ball of stress. Peter can get very serious when he's angry. As an introvert who gets mistaken for an extrovert often, I gotta add myself to the group of folks pointing out that the assumption that introverts are shy or quiet, or avoid chatting and social settings, is just a stereotype. There are introverts who are shy and quiet!! But there are also introverts who are talkative and enjoy social interaction -- I'm one of them! I'm SUPER talkative and I love interacting with people, I'm just very tired afterwards and need time by myself to recover. I struggled to explain this to my friends, who didn't understand ideas like "I can't hang out with you because I was just hanging out with someone yesterday and I'm socially tired," so I came up with the social energy = physical energy analogy to kind of explain it. I'll also point out that not everyone falls into one of these two categories. Introversion vs Extroversion is more of a sliding scale, and ambiverts are a thing that exists!! Desperately needing social interaction to recharge while also being exhausted or overwhelmed by too much of it is an experience lots of people have, that would make an equally interesting character!! How about y'all? Are your main characters introverts or extroverts? Runewriters basically has three main protagonists - Tareth, Sev, and Jonan. Severian is Extremely Extroverted in the traditional outgoing way, while Tareth and Jonan are both introverted -- but Tareth and Jonan have a difficult time understanding each other because their introversion manifests in different ways. Tareth is very shy and easily overwhelmed if she's dealing with folks she doesn't know, but genuinely likes people and wants chances to connect with them and make friends. Jonan is not shy at all -- he's not intimidated by crowds or public speaking -- but doesn't like the majority of people and doesn't enjoy opening up to others and tends to want to be left alone. While Tareth is terrified of crowds but comfortable being close to a single friend, Jonan is the opposite. I never really liked the moral that tends to happen a lot in stories, where the introvert has to learn to "loosen up" as the extrovert drags people into their life (Shrek and Donkey are the first example of this that come to mind). I think in reality it has to be a bit of both -- the introvert learning to reach outside of their comfort zone to meet the extrovert's needs, but also the extrovert learning to respect the barriers that the introvert needs. Compromise and communication! I think it would be cool to see more of that. Fun side story, I got to talk to him for like an hour at the Raleigh Comic-Con. This was WAY back before he hit it big... he had just started writing Sam & Twitch but I was a fan of his AKA Goldfish. His table wasn't getting a lot of love but me and a buddy were both big fans so we took advantage of his time. He was super cool to talk with. It was neat to watch his career blow up after that. Many establish that Peter keeps making jokes to try and calm himself when he's on the field, since he's such a little ball of stress. Yeah, that's the way I've always liked it written too. AKA Goldfish and Jinx were really good, couldn't get into Torso. But he really turned it up a notch with Powers, great series. I think @shazzbaa makes a great point about the trend to have introvert characters learn a lesson about not being introverts in a lot of media because of this perception that introvert=antisocial/shy/awkward=something to be fixed. Which isn't a great message as the moral of a story. For me that falls in with the quiet nerdy girl was beautiful all along just because she took off her glasses and started interacting tropes. I love the dynamics that can come from opposite characters like this but they've definitely got to learn from each other rather than it becoming one almost saving the other from a life alone sort of situation. My pair actually starts in a situation similar to that in their backstory, roomed together at boarding school with Eric, the extrovert, assuming he needs to help Isaak, the introvert, meet people and have fun and doesn't see why he spends so much time studying. Isaak in fact doesn't have any problem with people and like some company, but would just rather it wasn't loud and noisy and partying and needs to study because being top isn't something that comes naturally. And they do eventually figure each other out. (That's a simplified version for the sake of brevity). But yeah compromise and learning from each other is definitely something I'd like to see more of too and less of the stereotypical save the introvert and fix them plots. Introverts are really interesting people because some of them are the type who want to make friends and be with other people but they're legit too shy, and then others are the types that just like being alone and don't care about having friends XD. Your characters sound well-written and interesting <3 I would honestly love a story where an introvert has to teach an extrovert how to respect boundaries and maybe how to teach them a skill that introverts are better at--like writing and more of the art forms--because you don't get to see stories like that too often~!